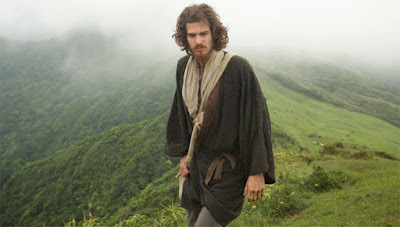 There is an indelible shot early in Grandmaster Martin Scorsese’s long-gestating religious epic “Silence”, set in the mid-17th century, in which two Portuguese priests, Rodrigues (Andrew Garfield) and Garupe (Adam Driver) are aboard a boat bound for Japan in hopes of finding their spiritual mentor Father Cristóvão Ferreira (Liam Neeson) who, it is said, has renounced his faith. We do not see the priests in this shot. Instead Scorsese has the camera high above the water, looking down at the ship, which, for a moment, evokes Marty’s beloved God Eye’s Shot, in which the camera is meant to approximate the POV of the Supreme Being looking down on everyone and everything. But then, the camera tilts up, away from the ship, and then pans up, up through the clouds, where it finds the sun shining. This is not God’s POV at all. You can look at that sun and see whatever you want – a sphere of hot plasma or God Himself. It’s up for debate. 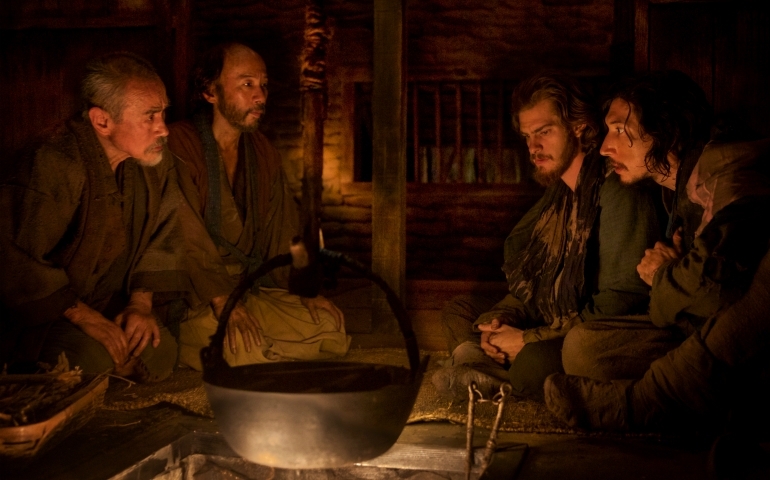 Not, mind you, that Scorsese is interested in questioning the existence of God; that would require an even longer, even more challenging movie than the long, challenging “Silence.” No, he is interested in taking a character whose faith in God is absolute and then challenging that character’s faith. The film is based on a 1966 book by Shusaku Endo, but you can see the roots of this movie all the way back to the famous shot of Harvey Keitel in “Mean Streets” holding his hand to the flame, testing himself against the fires of hell. “Silence”, in fact, goes a lot further than that, and does so right from the beginning with Father Ferreira and other Christians being tortured with boiling water from springs called jigoku, or “hells.” To see this is to understand why Ferreria might have renounced his faith and taken on Buddhism. Rodrigues and Garupe, however, young and idealistic, refuse to entertain such a thought. By faith alone they assume Ferreira was forced to turn and readily volunteer to go save him despite the inherent danger. The landscape they find is similar to the one see at these boiling springs, short on sunshine, heavy on gray. They are forced to hiding throughout the day while they minister the sacraments to Japanese Christians who take them in. These Christians here are predominantly portrayed as one faithful, fearful mass with next to no shading. In one scene, Rodrigues baptizes an infant, prompting the child’s parents to immediately wonder if their baby is now in heaven? Rodrigues must explain that’s not how this works. But it is nevertheless a window into the psyche of these persecuted Christians, where the possibility of a paradise in the next world is all they have, which actually lends credibility to the single-mindedness of all these characters. This is all they have, why would they be anything else? This is all Rodrigues has too and his gradual unraveling is the most potent element in the film. Garfield, of course, also starred in 2016 in Mel Gibson’s “Hacksaw Ridge”, another movie that was about a devoted Christian whose faith was tested but for the fact that his faith was not really tested at all. He was so rock solid in it that everything he went through, from boot camp to bloody war, became mere white noise as he moved along unencumbered, always beholden to what he believed. Rodrigues, on other hand, has no such luck. His almost naive cocksureness as he and Garupe initially set sail gradually withers as he is put through endless trials until he is nothing but a wispy husk of the believer he once was. And if the concluding suggests that he still holds onto his faith, it nevertheless feels like a much more tenuous grip.